Many of us have personally seen the value of coaching in the workplace, when leaders can truly help their people to realise their potential. Leaders who find opportunities to coach their teams help team members to build confidence and self belief in themselves, help them to discover a greater self awareness and understanding of their impact, and by encouraging self directed learning, development and action, ensure they remain accountable for their own performance. Mindset – are you mining for gold? 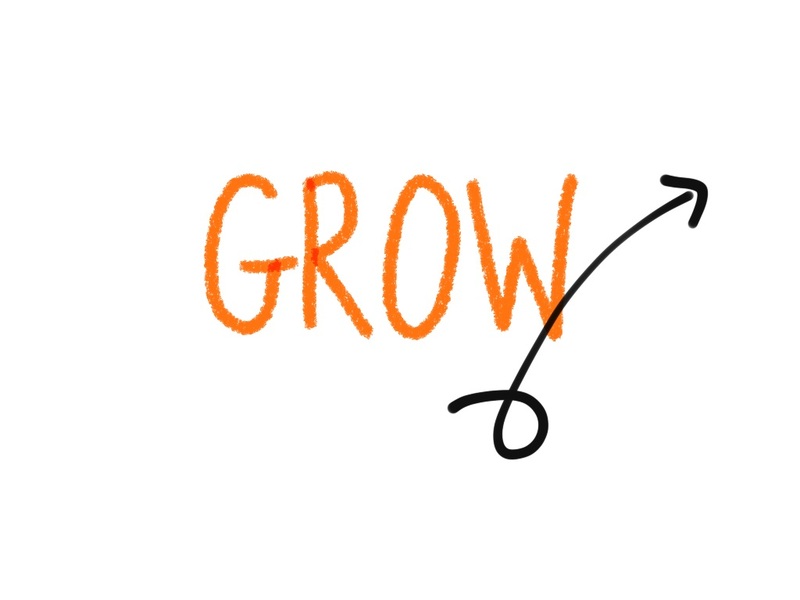 It is difficult to find a ‘good’, simple, short video that outlines the GROW coaching process! However we have found one that we thought people might find helpful and have included it here. Additional subtleties on coaching that we think are important to consider… read these after you watch the video! 1) Why have a coaching conversation? The first part of this video suggests there are times that the leader wants their team member to do things differently. That may be true at times, but that may not be the only reason for having a coaching conversation! 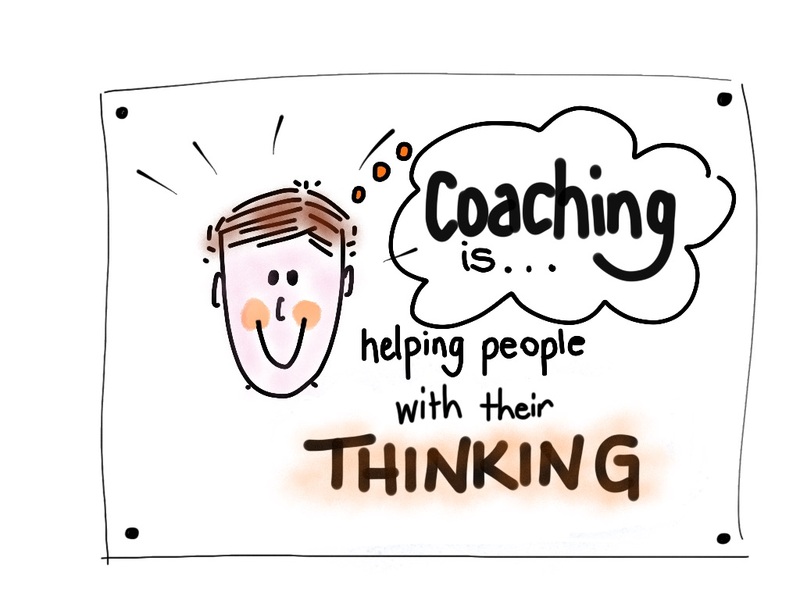 We define coaching as – helping people with their thinking. As we described in our ‘Coaching is not helpful? !‘ post, this simple approach to coaching is premised on the idea that the answer lies within the person you are trying to help – they just need a little guidance, time and focus to clarify their own thinking. It’s empowering them to take responsibility for their thinking and the decisions they make. If it’s helping someone else with their own thinking, then in practical terms its essentially asking questions to help someone to better understand and gain insight into their situation, the options available to them and to make some choices about the course of action they will chose to pursue. What it is not, is taking ownership of the problem for them, providing the solution to them or undertaking collaborative problem-solving together. Sometimes these are necessary and appropriate approaches but they don’t fulfill the intent of coaching – helping an individual to become more aware, take responsibility for action and build their confidence. So a leader may need to actually tune in to the ‘coachable moment’ – to sense when there is an opportunity for learning. Not just to do things differently. 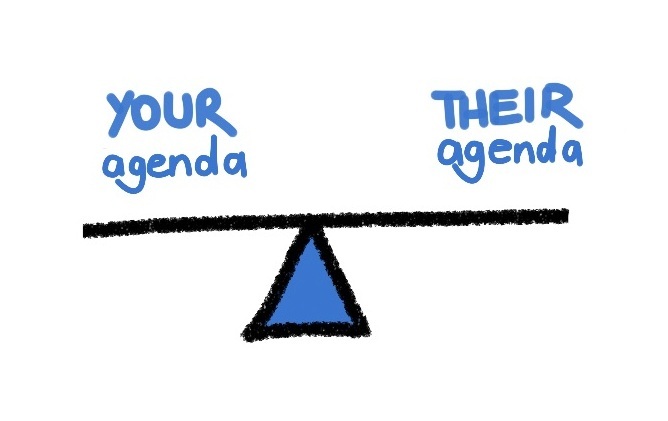 2) Who’s agenda? Your goal or their goal? The first few seconds of this video also suggests that your team member may be in a ‘blind spot’ and that is why you need to have a coaching conversation. It also suggests that the goal may be either yours or theirs (0.46). The most pure, and most effective coaching conversation is one where the agenda (goal) is that of the coachee; where they initiate the conversation themselves, or you sense the coachable moment and ask them if you can help them with their thinking. The coachee should own the goal. You do not necessarily need to have to agree the goal with them. There may be times though, when you may wish to provide some constructive feedback to someone – and use the coaching approach to help bring them out of their blind spot or share your observations. Do not try to trick people into thinking it is their agenda – that it is a ‘coaching conversation’ and you are helping them with their thinking. There are times for other conversations too when you are a leader – when you may need to provide constructive feedback, instruct people on an area of skill development, deal with poor performance, do more ‘telling’ than ‘asking’. To ensure that the trust in the relationship is not negatively affected, it is important that your intention for having the conversation is transparent. But you could provide some constructive feedback – and if the coachee wants some help with their thinking, use a coaching approach. So, discuss the issue or behaviour of concern and seek to secure some buy-in for an exploration about it. Invite self assessment where you can. Awareness and responsibility are better raised by asking rather than telling so the principles of coaching are helpful to use in conversations with team members – when the goal may have originated from you. But make sure the parties know what sort of conversation they are having! 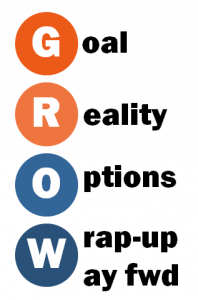 In a real coaching conversation, it is not uncommon to spin between the G & R stages. This is quite normal and may actually be an important thing to do. Your role in the reality stage is to ‘help them understand what is happening and to gain further insight.’ If this is done well, it will either validate their goal or help them have greater clarity about what the ‘real goal’ might be. 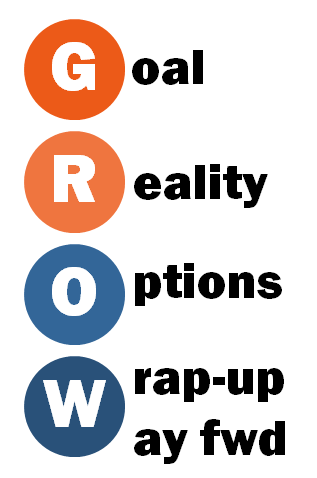 You may find your GROW is more like GR GR OW! 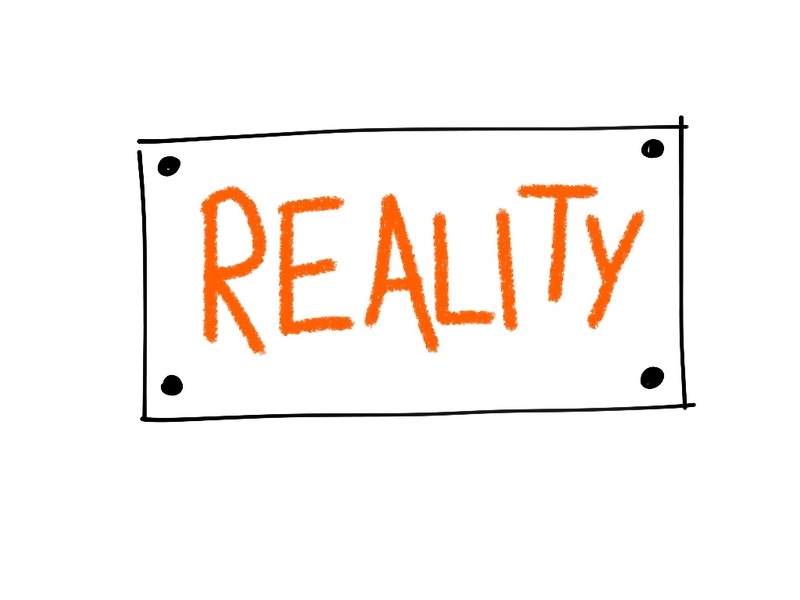 4) The Reality stage is really important. Don’t rush to options too quickly. An option question should help the coachee generate a wide range of options to close the gap between Goal and Reality – so the reality needs to be well understood. 5) Closed questions can play a role too. And some of the best ways to get people talking are not questions at all! And find places to use terms like ‘when you say…’, ‘tell me …’. They are not questions but are great ways to keep a person exploring a theme you have tapped into, or to get a conversation on its way.